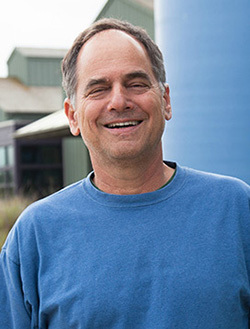 Gary Griggs, distinguished professor of Earth and planetary sciences at UC Santa Cruz, has led the campus's Institute of Marine Sciences (IMS) since 1991. At the end of June, he will step down as IMS director and return to full-time teaching and research. "I feel extremely fortunate to have been able to lead the institute over the past 26 years, through an important period of growth and productivity," Griggs said. Peter Raimondi, professor of ecology and evolutionary biology, will take the helm as director of the IMS on an interim basis starting July 1. "It is hard to overstate Gary Griggs' impact in shaping IMS and making Santa Cruz a destination for educators, government agencies, and entrepreneurs focused on marine and coastal issues," said Paul Koch, dean of physical and biological sciences. Established in 1976 as the Center for Coastal Marine Studies, the IMS is an interdisciplinary research unit supporting a diverse group of faculty and researchers working on marine biology, coastal ecology, fisheries and fishery management, ocean processes, marine toxicology, and marine geology. IMS researchers have earned international recognition as experts on marine mammals and seabirds, coastal ecosystems, marine protected areas, harmful algal blooms, climate change, sea level rise, and other topics. The institute provides state-of-the-art facilities both on the main UCSC campus and at the Coastal Science Campus, which has grown dramatically since Long Marine Laboratory opened in 1978. Griggs was instrumental in establishing partnerships with state and federal agencies, leading to a NOAA Fisheries lab and a state marine wildlife center now located at the Coastal Science Campus and a U.S. Geological Survey lab nearby. Interactions and collaborations with scientists at these agencies benefit both research and teaching at UC Santa Cruz. Griggs also oversaw the development of new facilities at Long Marine Laboratory, including the Seymour Marine Discovery Center, with its public outreach and education programs, the Ocean Health building, and a major expansion of the marine vertebrate research facilities currently under way. A new Coastal Biology building to house the Department of Ecology and Evolutionary Biology is set to open this summer. "None of this was quick or easy," Griggs said. "One thing I learned is you have to be persistent and have a vision." Every important project needs a champion, he said, crediting William Doyle, his predecessor as IMS director and a professor emeritus of ecology and evolutionary biology, for getting Long Marine Lab and the marine science program off the ground in the first place. "It's exciting to see what we've achieved over the years from what Bill Doyle and Ken Norris started," Griggs said. Raimondi said he is excited about the opportunities created by new IMS facilities and programs. "The expansion of the marine vertebrate facility will be completed soon, and it's a major upgrade, including a complete renovation of all the pools. It will give us the capacity to do a lot of things we couldn't do before because of the larger pools," he said. Raimondi also noted a growing emphasis on developing the science needed to address marine and coastal policy issues, reflected in the new graduate training program in coastal science and policy that will be based in the Ocean Health building. "The integration of coastal science and policy was envisioned years ago by Gary, and it is now coming to fruition," he said. Griggs, who joined the UCSC faculty in 1968, is an expert on coastal geology, shoreline processes, geologic hazards, and the impacts of sea-level rise. A popular teacher, he has been teaching an undergraduate course in oceanography to about 200 students every year for almost 50 years. 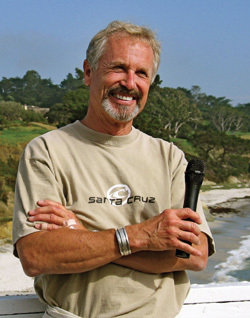 He is the author or coauthor of eight books, including Living with the Changing California Coast; California’s Coast and Beaches; and, most recently, Our Ocean Backyard, a collection of essays from a column he has been writing for the Santa Cruz Sentinel for the past nine years. He has two more books in press that will come out later this year. Griggs has earned many awards and honors for his research and teaching, including a Distinguished Teaching Award from the UCSC Alumni Association and Outstanding Faculty Award from the Division of Physical and Biological Sciences. Raimondi is known for long-term studies of coastal ecosystems, including ongoing surveys of the intertidal coast of North America from Baja California to Alaska, and as a pioneer in ecology-based management of fisheries. He was chair of the Department of Ecology and Evolutionary Biology from 2003 to 2016, and he has served on advisory panels for a variety of state and federal agencies. Raimondi received his division's Outstanding Faculty Award in 2012 and the Ron Ruby Award for Teaching Excellence in 2009. He earned his B.A. in philosophy at Northern Arizona University and his Ph.D. in biology at UC Santa Barbara, and joined the UCSC faculty in 1996.